More of a B&B (minus the breakfast) than a full-service boutique hotel, Casa Nuevo Leon is a good find for independent travelers who don't need amenities and fawning service. 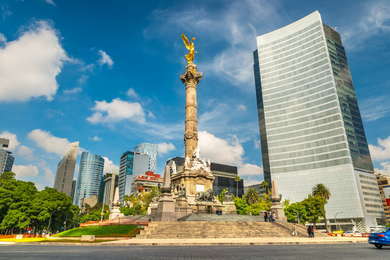 Condesa is one of the city's most exclusive neighborhoods, and the hotel could not be better situated. It's like having your own immaculate studio apartment without resorting to AirBnb. YOU SHOULD KNOW If stairs are a concern, there is no elevator, and no ground-floor rooms. Spacious and stylish, with beautiful, often whimsical, furnishings by local artisans, and vividly patterned tile floors. No matter the weather, you'll want to use the industrial-size fan in your room to help drown out street noise. Bathrooms in most rooms are quite large, with walk-in showers. Hotel is accessed via buzzer, and the always-manned front desk provides additional security. The on-site restaurant is good in a pinch, but you're better off exploring the dozens of better options at your doorstep. The first Mexico City restaurant from noted Oaxacan chef Rodolfo Castellanos, Poleo (6-minute walk) serves delicious upscale Oaxacan cuisine with good mezcal and wine lists. Merotoro (5-minute walk) is an Italian-slanted Mexican restaurant from chef Jair Téllez, who also has Amaya (12-minute drive). With a curious Charles Darwin theme, the stylish, grown-up Baltra Bar (6-minute walk) serves some of the neighborhood's most inventive cocktails. Wallace Whisky Bar (5-minute walk) has over 200 whisky brands and makes immaculate versions of classic drinks. If want to stay in Condesa, are on a budget, and don't need a full-service hotel, this might be your best choice.